Gen Xtinct: Nancy, Nancy Drew, where are you? 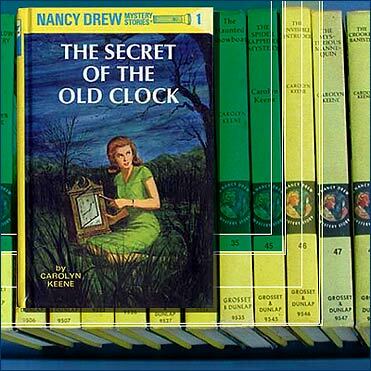 Lovvvvvved Nancy Drew. There are approximately 8 zillion different bindings, but mine were the yellow-backed ones with full-color covers where Nancy has kind of a Marlo Thomas "That Girl" flip going on. Nancy had it going ON. Yes, her mother was dead, but Nancy didn't dwell on that. Her dad was a hotshot lawyer who let her have her own blue convertible (changed to a hybrid in later books), she had a motherly figure in the form of housekeeper Hannah Gruen, she had two best friends, cousins Bess and George, she was recognized in every police department in the country, she apparently had neither a job or classes, and of course she had a boyfriend, although really, Ned Nickerson was pretty Ken doll-bland. Growing up a girl in the 1970s was pretty OK in many ways. You really were encouraged to do anything a boy could do, and Nancy was a big part of that. I always thought of the Hardy Boys as her slightly slower cousins. And today? She even has an iPad app, which I may just have to get. Were you a Nancy fan? Do you remember any one book over the others? I also read other series like they were going out of style: Bobbsey Twins, Happy Hollisters, Dana Girls, Three Investigators, Trixie Belden...you name it. Any of those in your childhood bookshelf? Didn't read hardly any Nancy Drew, but I did read the Hardy Boys a lot. There were others that I liked so much I'm now trying to collect the series as an adult: Three Investigators, Encyclopedia Brown, Alvin Fernald, Danny Dunn, the McGurk Organization, the "Trick" books by Scott Corbett... Probably my favourites were Elizabeth Enright's books about the Melendy family, although those are somewhat older. And now that I'm doing that I've discovered other stuff that I should have been paying more attention to at the time, like Swallows and Amazons, Diana Wynne-Jones, and Troy Nesbit. I read EVERYTHING I could get my hands on, so naturally I had a lot of Nancy Drew books. But since I had a quiet, bookish older brother, a brash middle brother who looked like my twin, a petted and indulged baby brother, and a poorly trained dog, you can probably figure out who my favorite girl sleuth was. Unfortunately, though, I didn't have a filthy rich best friend who owned horses. I was too ADD to do a lot of reading as a kid (being turned on to sci-fi would come later), but I had a good friend who was utterly obsessed with mystery series. His whole basement was filled with Nancy Drew, Hardy Boys and Bobbsey Twins books! This was around the time when the Hardy Boys/Nancy Drew TV series was on, and that seemed to me as boring as the books (although I thought the girl who played Nancy was kinda hot). I also remember a lot of weird stories about who actually wrote those series. Come to think of it, the Nancy Drew books were pretty progressive for their time ('50s and '60s) for the way they portrayed a girl with can-do spirit. I've only recently discovered your blog and have been reading past posts. I had to comment on this one, though. I never read much Nancy Drew, it was more my sister's type of book. But I remember one that has stuck with me for 30 years or so. I think the title was something about an attic but the thing I recall most was someone (housekeeper, maybe?) getting bitten by a black widow spider. I still get creeped out thinking about it.